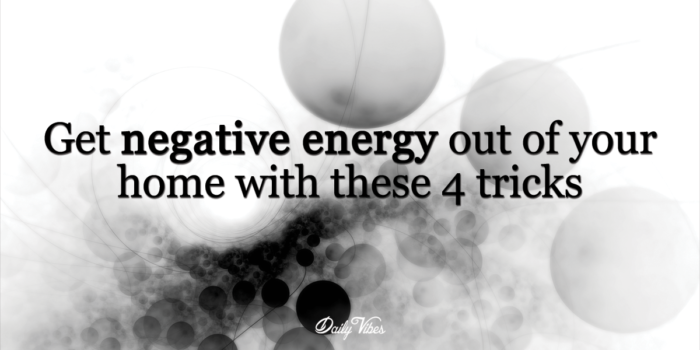 Negative, harmful energy can find its way into our homes. Whatever the reason for it entering, it’s important to perform some regular rituals to rid our homes of it. Regularly removing negative energy from your living space will help restore balance and harmony. You should repeat the following 4 cleansing rituals if someone is sick, a lot of people have entered your home, you moved into a new home, you feel negative emotions, or negative occurrences keep arising. Burning sage is one of the oldest and fastest ways to remove negative energy from your home. To perform a sage cleansing, open your front door and the windows in the house. Starting from the back of the space, light the sage, let it burn a moment, then blow the flame out. Proceed to walk around the room covering as much of it as you can. Using a feather or feather fan, waft the sage smoke into the corners of the room up to the ceiling. Make sure to go into every room as you move from the back of the house to the front. When you’ve reached the front, walk out the door and sage around the door and frame. Leave the sage outside to allow it to burn off. Then light some frankincense resin or copal incense and perform the walk again. Doing this will ward the negative energy off on a deeper level. Pour sea salt into the four corners of your rooms and let it sit for 48 hours. This will absorb the negative energy of previous owners, if you are just moving in, or the negative energy of people who are sick or arguing. After the 48 hours, either vacuum or sweep the salt and throw it away. For extra protection, grind up saffron and mix it in with the salt. In Tibetan tradition, evil energies do not like the smell of saffron, so they won’t enter a space if saffron has been used. Then, clean the doors and windows of your home thoroughly using a mixture of the juice of 5 lemons, a cup of salt and a 1/4 cup of white vinegar added to a bucket of water (the mixture is strong, so use gloves). Once the surfaces are dry, pour sea salt on the window sills and on the floor by the door to prevent the negative energies from re-entering your home. Black tourmaline absorbs negative energy from people and spaces. To use it, place a piece in each corner of a room. Doing this builds a protective shield to prevent negative energy from entering your space. It also absorbs electromagnetic energy, so keeping it near your Internet router, television, computer, and other devices protects you from their harmful energy, also. Black tourmaline eases anxiety and depression, so holding it in your hands can pull the negative energy from your own body out. Think about all of those scary, haunted houses you see in horror movies. They’re usually empty, dark and quiet. A quiet space attracts negative energy, which is why sound is such a powerful cleansing method. Walk around your home ringing a bell, chimes or using a singing bowl to prevent negativity from residing in your space.